The ohmHook is a tool that allows the user to sense the electrical properties of the material they are manipulating while they are manipulating it. Electrical resistance is a material property that we humans have no sense for, but have built ourselves tools to probe. 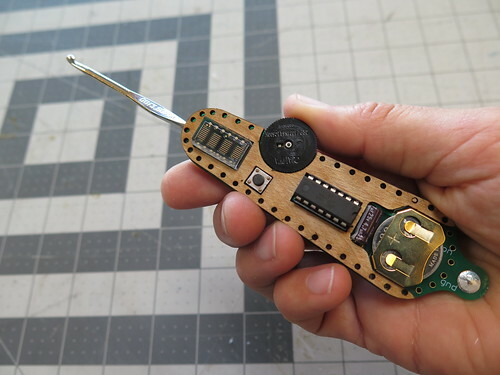 The tools for manipulating conductive materials are separate from the tools that allow us to measure conductivity, meaning any process interested in doing both becomes one of switching back and forth between making and manipulating. The ohmHook merges these two processes into one, inviting the maker to explore what it is like to sense the electrical resistance of a yarn throughout the process of crocheting it into form. 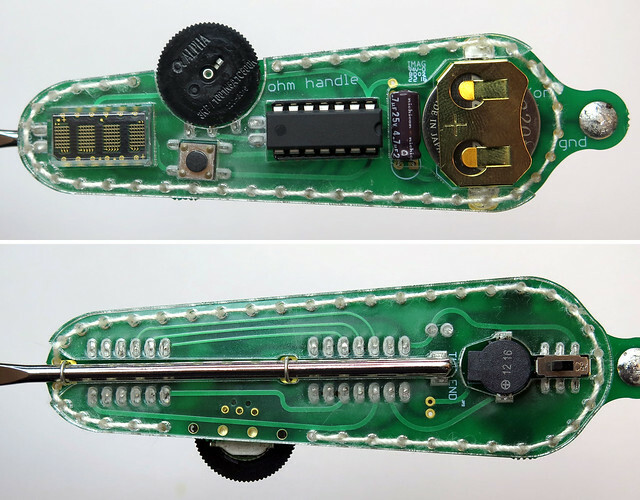 The ohmHook is made from a crochet hook mounted on a circuitboard including a microcontroller which measures the electrical resistance between the crochet hook and a crocodile clip connected to the opposite end of the tool handle. The resistance is displayed as the 10 bit reading of the microcontroller’s analog-to-digital converter. Having the ability to sense electrical propeties of a material as you are manipulating it can allow you to explore it’s potential for creating electronics. 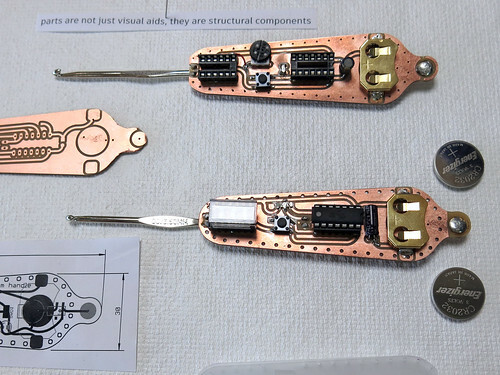 Highly conductive materials make good connectors between physically distant electronic parts. Materials with stable electrical resistance can be used to detect location of contact on their surface. Materials with varirable resistance often respond to forces such as stretch, pressure, bend and twist with a change in resistance, and can be used to sense a large variety of physical interactions. 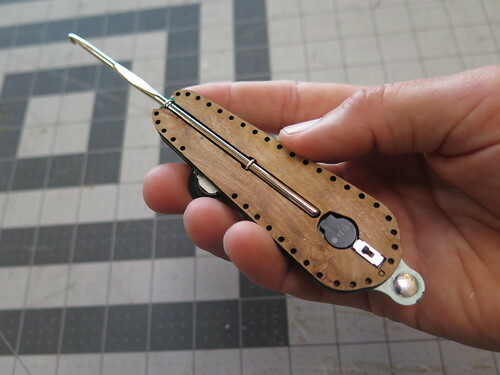 The ohmHook does not have to be used for crochet. Use it to probe and explore all kinds of materials, and to invent new ways of building electronics.